Baños is a fun and energetic city on the Amazonian slopes of the Andes. Only 3 hours south of Quito, Baños is a perfect location to explore the natural beauty. 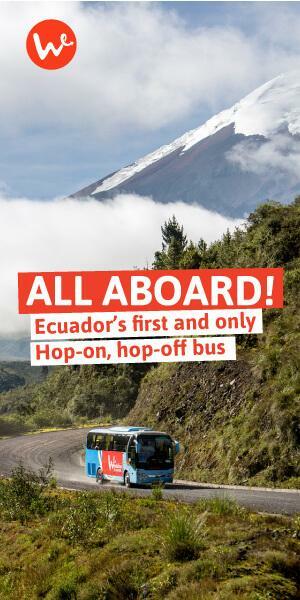 Plus, do some crazy extreme sports and party while you’re at it! While the town itself can be a little be garish, with lots of tourist operators offering excursions and attractions… the mountain biking, hiking, rafting and partying make it a great place to visit. Baños is famous for its Waterfall Route: a road that winds down a valley dropping steeply from the Andes towards the Amazon. Located along this route are a dozen of the most stunning falls you can find, including the famous ‘Pailon del Diablo’ or Devil’s Cauldron. The road is semi-adapted for cyclists, which makes for a great day trip. The descent is smooth as the road drops 1000m from Baños in a short span, but a really hard climb (luckily you can get the bus back!) The waterfalls are accessible by cable car, or a short hike into the valley below. 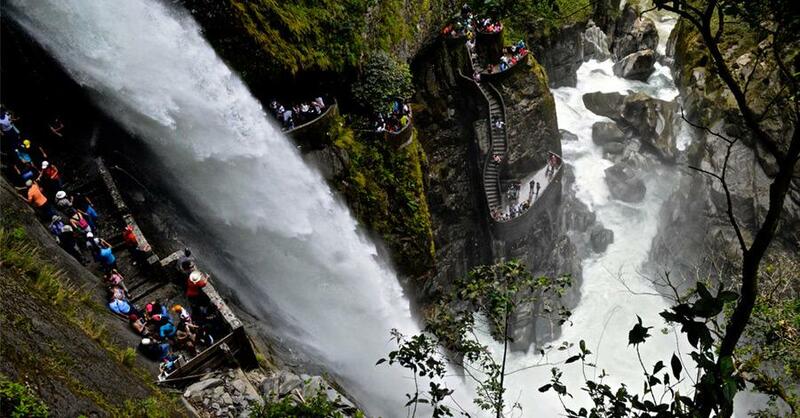 The star of the show is the Pailon del Diablo, the second largest waterfall in Ecuador. For a small fee you can crawl up a series of caves in the rockside until you are directly behind the waterfall. Bring a poncho or raincoat as you will get soaked! Other activities in Baños include bungee jumping off bridges into the lush green valleys below, canyoning down waterfalls, white water rafting, rock climbing and horseback riding. You can book any of these activities in the numerous tourist agencies around town. Pretty much every building in Baños is a hotel, so you’ll have no trouble finding accommodation. Cheap hotel rooms are around $8-$15 per person, with more upmarket options available. There is a large variety of eateries, from the traditional llapingachos for less than $3, to international restaurants. If you are an espresso fan check out the great local coffee shops. Baños is in a valley surrounded by beautiful mountains, including the active Tungurahua volcano. A great way to experience these mountains and get amazing views of the volcano is to visit la Casa del Arbol, a treehouse with a famous swing that literally swings you over the valley of Baños (you’ll have seen this one on anybody’s instagram who’s been travelling in Ecuador). The owner actually set this place up to monitor the Tungurahua for possible eruptions, and is at the ready to alert nearby towns to evacuate. The town’s full name is actually Baños de Agua Santa, literally translated as ‘Baths of Holy Water’ due to its volcanic springs, with waters high in minerals. Check out the spas located all around the town and outskirts, ranging from cheap massages to luxury spa complexes in hotels. There are some hot thermal pools that are worth a visit, the closest being Las Piscinas de la Virgen. A day trip in Puyo is good fun, trips usually include some hikes and visiting indigenous communities. One amazing place you can visit is a lookout called ‘Mirador Indichurris’. It looks out over the Pastaza river as far as the eye can see. A sunset here is definitely worth the trip. The area is considerably warmer than Baños, so make sure to take some lighter clothes. 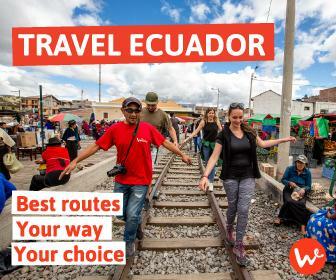 If you are looking for advice on where to go next, check out our articles on two great spots in Ecuador: Cotopaxi Volcano, and Montañita, a fabulous beach town in Santa Elena. Or try these other five beaches in Ecuador.